1) Where do you keep him? He’s stored in a safe on UCL main campus. The head is kept inside a Victorian bell jar, inside his own hand carved wooden box (with his name and various UCL logos on the outside). The box takes 4 keys and a couple of people to (carefully) open it. We don’t say exactly which safe and where, for security reasons. 2) How often do you bring him out of his safe? He’s inspected at least once a year, by the staff with responsibility for him (currently me, Emilia and our other conservator Susi Pancaldo). It was a conservation lecturer at the Institute of Archaeology, James Hales, who started inspecting him regularly, around 2002. Before that we believe it was fairly ad-hoc. 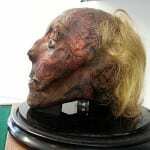 the condition of Bentham’s head. 3) What’s the process for checking? For our regular checks, we are looking for changes in his appearance that might indicate a deterioration in his condition. In order to do this we have produced a detailed report on his condition along with annotated photographs to check against. Types of things that are recorded in his condition report are: any hair loss, indentations in the skin or holes, tears or cracks in the skin, evidence of any insect activity, lightening or darkening of the skin, and even smell! Each year, we check him against the original photographs and note any difference we may see. 4) Have there been any noticeable changes from the last time you checked? No noticeable differences. 5) Is there anything you’re particularly worried about and want to keep an eye on? I would have to say that the most fragile part of him is his hair, which is now easily pulled from the hair follicle. Because of that, we have to be very careful when removing the glass dome as any static cling could potentially pull hair with it. We are also very careful when we move him since any vibrations or shaking could dislodge hairs. Since we know this is the fragile part of him, we also do not pick him up on either side of his head, but rather use the wooden base of the box as a handling tray. For the future, I am also keeping a watch on the skin itself since I suspect that some kind of oil or leather treatment may have been applied in the past as it has a slightly waxy appearance. I want to make sure that any past treatment is not causing damage to the skin by oxidising and causing deterioration of the tissue. 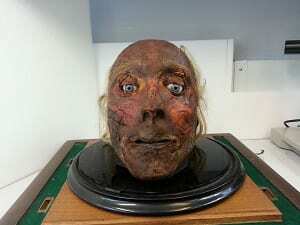 Front view of Jeremy Bentham’s head. 6) Why does he smell? Is his brain still in there? No brain I’m afraid. That would have been removed before the head was suspended over sulphuric acid. The process would have liquefied the soft tissue of the face and it would have leeched out, with only the skin remaining. 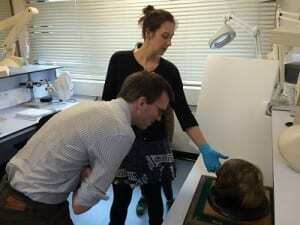 With all types of mummification processes, there tends to be a slight odour associated with the remains. While the mummified remains are stable, they often give off a slight musty smell. Egyptian mummies are a perfect example of this and what I have noticed when working with these types of collections. The reason tanned leather doesn’t have this sort of smell is partly due to the fact that with tanned leather, the protein chains in the collagen become cross-linked by the tanning chemicals and resistant to decomposition. Rawhide, which is not chemical tanned leather, has a slight musty smell that is not too dissimilar to Jeremy Bentham. 7) What are all the various imprints and marks on his head from? 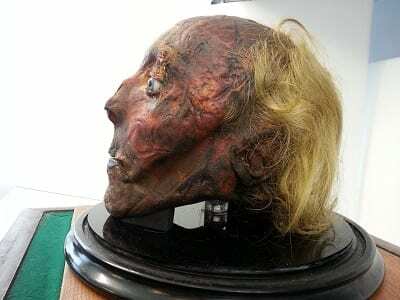 These are only really theories based on what we know about the head and what’s happened to it over the years – The two straight lines that you can see on the top of his head and running down one side are thought to come from when the head was originally mummified – when it was suspended over sulphuric acid to draw the moisture out. There is a hole at the top, with a circular mark, which comes from the spike which runs up the back of the auto-icon, and nut which was used to hold it in place on the spike. Just to make it clear – the head was NOT used for a game of football in the quad. In addition to the lines, he also has small even pin pricks in the skin, concentrating mainly on the forehead. My theories for these are that the pin pricks are from the mummification process and were done to relieve pressure or tension in the skin so that it wouldn’t split. Or that they were done so when the mummification process was complete, any oil or leather treatment used could soak into the skin more effectively. The jury is still out! 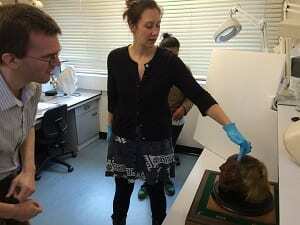 Emilia Kingham is a Conservator in UCL Museums. Thank you for this account. It is fascinating. If I understand the manner in which The Head is attached correctly, then it is notable and perhaps sort of comical that the head’s positioning may offer the head a “panoptical” function, if a mechanism were attached to the turn table.